The Lion Bible in its Time enables young readers to access the great sweep of the Bible by linking its main stories and people to its fascinating and diverse historical and geographical setting. Key to this book are 14 astonishingly detailed reconstructive vistas from the ancient world, picking out salient points in biblical history including the great flood, the people of Israel in Egypt, Jerusalem, Capernaum, and more. 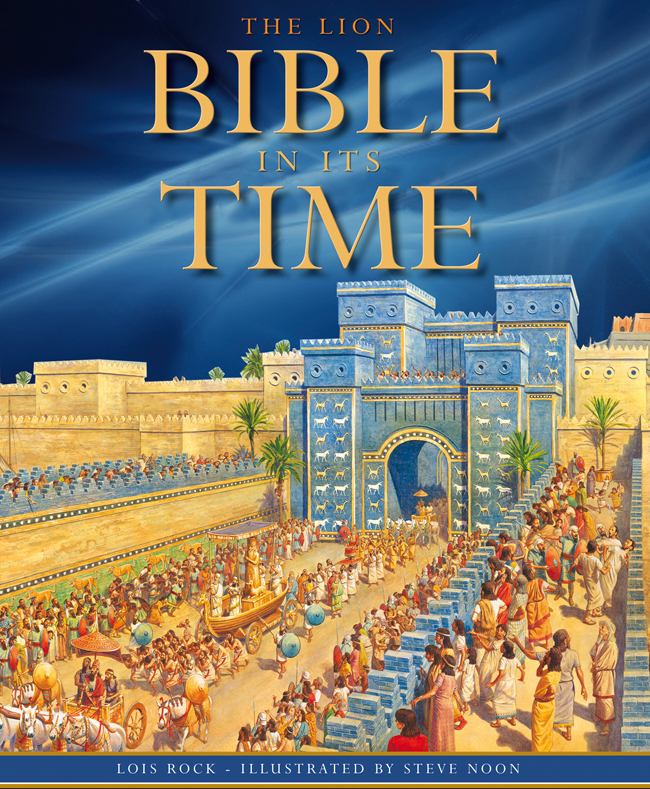 These vistas punctuate chapters which further uncover the people, places and events of the Bible, illustrated with carefully referenced narrative pictures and informative maps which continue to unfold the great sweep of biblical events. The result is engaging and accessible to young readers, both browsers and aspiring scholars. 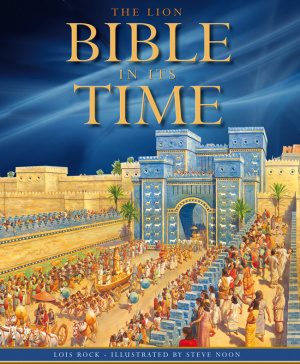 Lion Bible in Its Time by Lois Rock was published by Lion Hudson in September 2011 and is our 22328th best seller. The ISBN for Lion Bible in Its Time is 9780745960159. The suggested age for this book is 7 plus. That’s good, because adults could get a lot from it as well as young and older children. The detailed pictures at the start of the many chapters are works of art and imagination that reward careful inspection – with a magnifying glass you can spot things you would miss otherwise. It really is worth the effort! The book is liberally illustrated, and where these are based on known facts the reference is given, but many say this or that might have been as portrayed, we cannot know for certain and this is made clear. The amount of known facts is truly amazing and the text sets out clearly – albeit briefly – the History of the times the books of the Bible are set within. A book to read through, a book to dip into, a book to enjoy and learn from. Got a question? No problem! Just click here to ask us about Lion Bible in Its Time. A:The Lion Bible in its Time is a great reference book for children that find visual images the best way to learn. It's full of information and is extremely detailed. The style of the book is similar to school reference books for ages 8 - 13 years. If you are looking a book that gives an older child a sense of context for bible times then this is perfect - however if you are looking for a book to help a child understand the bible then you may find a bible handbook more suitable. When I was a youth worker I always gave my 11 and 12 year olds a copy of The Bible Book by Nick Page - it's not only great for tweens and teens but also provides a valuable reference book for years to come. I still use mine today.